N'aww, so cute! I just wuv Inu so much! i love it so much,my god! OMG *O* OMG OMG OMG OMG OMG OMG! I really like it! 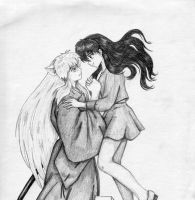 But I think it's kinda funny how even InuYasha -a male- even has one of those "Time of the months"
Amazing work on human Inuyasha. <3 Just love it. good work! what did use for the lineart and coloring? Thanks. I heard the Sakura pens were good, but so far this is the first time I've seen them used. Looks NICE. Exactly the way I love him!! Oh I like this a lot! He's so cute in his human form!